Entry is so easy, it’s like we’re handing you these tickets on a silver platter. Submit your information below to be entered to win. Note: We need this address to be able to send you the tickets. Please call us if you have any questions: 504-680-4113. One entry per household. You must be a Louisiana resident. Winners will be announced April 23, 2019, and contacted via the email and/or phone number provided. Transportation and housing are NOT included with these tickets. The tickets are for festival entry only. 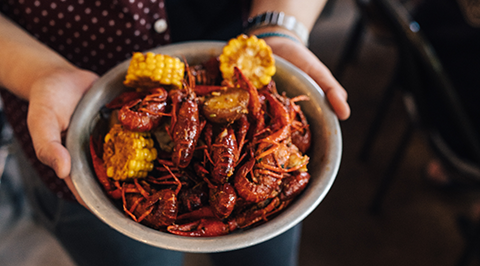 Have you been to the Crawfish Capital of the World yet? If not, you definitely should! All you need to do is to enter your email and phone to win a weekend of fun and delicious food. One entry per household. You must be a Louisiana resident. Winners will be announced April 23, 2019, and contacted via the email and/or phone number provided. Transportation and housing are NOT included with these tickets. The tickets are for festival entry only. Music: Listen to over 30 bands on three stages during the three-day festival. Breaux Bridge Heritage Tent: Check out accordion making, Cajun dance & cooking demonstration, and Bourrée, a traditional Cajun card game. Cuisine: Enjoy tasting crawfish prepared in every imaginable way. Crawfish Races: Watch the world famous race of the crawfish. Cajun & Zydeco Dance Contests: This event is a must for those who want to learn a few new steps. Crawfish Etouffée Cook-Off: Features cooking teams who vie for the title of Cook-off Champion. Arts, Crafts & Specialty Items: Admire handcrafted and novelty arts and crafts. Carnival Midway: Enjoy rides and games for all ages. Crawfish Eating Contest: See how much weight of boiled crawfish can be consumed within forty-five minutes. Parade: The parade honors our Crawfish Queen.